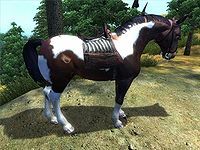 A breed of horse with a brown and white pattern. A strange form of troll created by the Brush of Truepaint. They are weak against turpentine, which can be applied to a weapon as poison when fighting them. 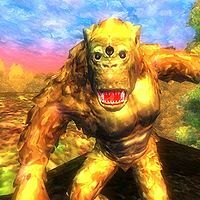 The first six trolls were created in 3E 433 as guardians by a foolish Bosmer or Altmer thief (reports vary) who tried to steal the brush from its owner, Rythe Lythandas. The trolls turned on their creator and killed him. The fat of Painted Trolls is very useful in alchemy, and by 4E 201 Rythe was apparently creating his own trolls in order to extract the rare ingredient. Parrots are a type of bird often kept as pets. 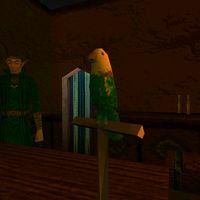 Gerrick, an Altmer merchant who lived on Stros M'Kai, had a parrot that revealed the location of buried treasure to Cyrus. A species of bivalve mollusks that produces pearls. A type of crustacean that can be found on Artaeum. 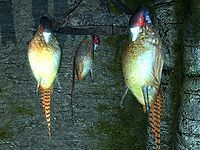 Pheasants are wildfowl often hunted for their meat, which is then salted and roasted. Pigs are common farm animals, raised for their meat. 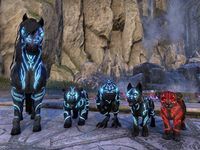 Psjiic pony, bear, guar, wolf, and senche. 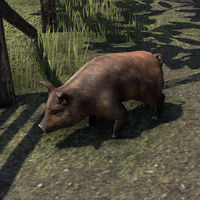 Psjiic beasts are creatures of the Psijic Order's design, conjured in the shape of their conjurer's desired creature form. They are distinguishable from common fauna by having arcane body imprints that the Order's monks use themselves. Although the beasts most commonly have a blue runic psijic imprints imbued within them, some are conjured with red imprints that represent a monk's regrettable choices. Some are conjured for use as pets, and others are conjured in a mature form to use as warmounts. 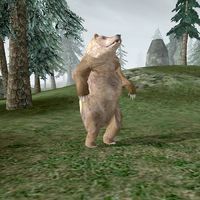 Of similar size to the Grizzly Bear, these beasts are more resistant against the surrounding nature than its cousin, and known to carry diseases. 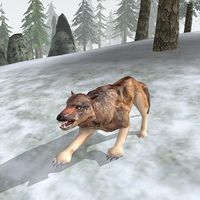 This type of red-furred wolf is known to carry diseases. The Pollywog is an aquatic life stage of the Grummites of the Shivering Isles. They are born from the egg sacs that Grummite females hang above water, out of the reach of their aquatic predators. The Pollywog quickly grows limbs, and turns into an amphibious Baliwog within weeks. 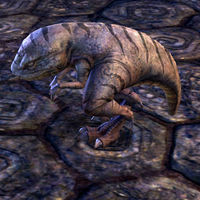 A smaller variety of guar that are popular house pets in Morrowind. They are described as being gluttons for attention. Pumpkin Spectres are humanoid pumpkin creatures. Visions of these nightmarish beings are summoned by hedge wizards during the Witches Festival, a holiday that takes place on the 13th of Frost Fall each year. 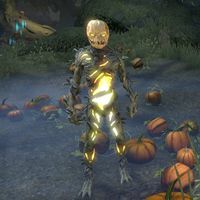 Hollowjack is a Pumpkin Spectre and a Daedra Lord who rules over the demi-plane of Detritus, although it is unknown if all Pumpkin Spectres are Daedra. A type of fish that can be found on Khenarthi's Roost. This page was last modified on 26 March 2019, at 18:20.